« A move for the ELM Chicago office & welcome to Marie! Guest Post by Dr. Norman Glaubenleben, Ph.D. Earlier today, the selection committee for Extraordinary Lutheran Ministries’ annual Unnamed Covert Sympathizer (UCS) Award announced that it will soon release the list of nominees for this year’s award. The Unnamed Covert Sympathizer Award, established through a generous gift from an anonymous donor (rumored to be Bishop [Name withheld] of the Central Great Lakes Synod), honors those who have helped to further ELM’s mission without appearing to support either the organization or its goals. The award is something of a paradox: no recipients of the award have ever been announced, and in spite of the selection committee’s stated intentions, the list of nominees has never been published. Each year after a date is set for announcing the year’s nominees, the selection committee is inundated with anxious requests from putative covert supporters who are concerned that public recognition might compromise their effectiveness. Before the list of nominees is made public, a covert sympathizer may (for a modest fee to cover administrative costs) inquire if they’ve been nominated. For a slightly less modest fee, the sympathizer may request to be omitted from consideration. Inevitably, all the nominees will have withdrawn before the list is released. Among people who should know, it is commonly supposed that administrative fees related to the Unnamed Convert Sympathizer Award have become a significant source of income for ELM, far outweighing, for example, the income lost from the Thrivent Choice Program. ELM’s secret supporters could easily dispel the illusion of “significant disagreement” over whatever the issue is that Thrivent believes to be ELM’s primary purpose. Were the sympathizers to declare themselves openly in support of ELM, they would reduce to insignificance the perceived level of disagreement. Doing so, however, would both deprive ELM of a reliable revenue stream and undermine the sympathizers’ clandestine efforts on ELM’s behalf. There have been repeated suggestions (by unnamed Thrivent spokespeople) that Thrivent Choice funds destined for ELM be laundered through safe, “neutral” intermediary recipients. Some observers have taken this to be an indication that the Thrivent “Neutrality Policy” itself is, in fact, the work of ELM’s covert sympathizers. Nothing could be further from the truth. However, such speculation is completely consistent with the counterintuitive logic of secret supporter covert operations. In 2012, following weeks of tense, closed-door negotiations and a reportedly frantic bidding war (said to include three mainline denominations, a Rocky Mountain megachurch, the political action committee of a Beltway evangelical think tank, and a Christian ashram), a deal was reached between a covert sympathizer and an undisclosed purchaser to transfer the trademark “Making Ministry Happen” to the purchaser for a cash settlement rumored to be in the low 7-figure range. The transaction fell apart when it was discovered that “Making Ministry Happen” is not in fact a registered trademark of ELM. 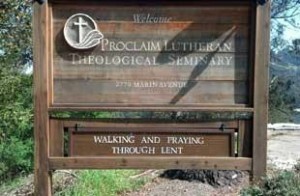 In February of this year, representatives of California Lutheran University (CLU) did nothing to address the rumor that an “unnamed” intermediary had floated an offer to buy Pacific Lutheran Theological Seminary from CLU for ELM’s “Proclaim” business unit. When outright purchase proved too costly, the intermediary is said to have bid for naming rights, proposing that the seminary be renamed “Proclaim Lutheran Theological Seminary”. CLU has yet to comment. Any of these projects, had they come to fruition, would certainly be award-worthy. But the covert sympathizers, still embarrassed over their 2009 failure to bolster ELM’s prospects by preventing policy change in the ELCA, have set an even higher standard for future achievements. No one who is aware of the covert sympathizers’ relentless behind-the-scenes work should be surprised in 2016 when ELM is reorganized as a Wisconsin nonprofit to pave the way for an offering of shares not unlike that made by the Green Bay Packers in 2012. For obvious reasons, the covert sympathizers will be unable to take advantage of the opportunity when the shares are available for purchase. Dr. Norman Glaubenleben (glaubenleben@lutheranconfessions.com) is chief business analyst for the now-defunct Lutheran True Confessions. Opinions expressed by Dr.Glaubenleben are entirely his own (except where plagiarized) and do not reflect the opinions of Extraordinary Lutheran Ministries (ELM), its staff, or board. Dr. Glaubenleben wishes you a very reflective Lenten season and a very enjoyable APRIL FOOL’S! This entry was posted on Wednesday, April 1st, 2015 at 7:25 am	and is filed under Blog. You can follow any responses to this entry through the RSS 2.0 feed. Both comments and pings are currently closed.